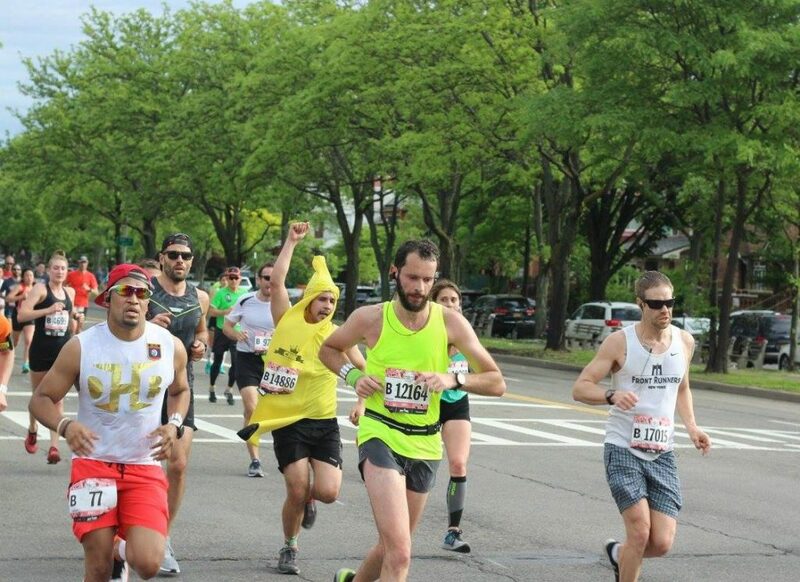 This week, a special race report from Gideon Bautista aka Captain Potassium, describing his journey running bananas. 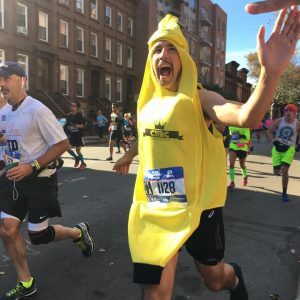 Whenever another Crown Heights Runner wants to race in a banana suit for the first time, I always say, don’t fret the aerodynamics, but steel yourself for a psychological gauntlet. Take my first race: Team Champs, 2016. There were two of us then. I often wonder if Spencer spent as much time worried what the other clubs must have thought. After all, being a permanent fixture in the corral preceding me, he could always peel away from me and be done with it. But was Spencer immune to such great doubts? That we were showing everyone up? Or that we were a bunch of clowns, not taking the 5 miles seriously enough? I’m always happy to be silly, but to think I was disrespecting the race, that made my skin crawl. If he thought any of these thoughts, his buoyant demeanor betrayed none of it. Ultimately, when it came down to that hot July morning, our reception was swell, with every spectator’s and fellow runner’s cheers a shot of adrenaline for us along the way. All this adrenaline, of course, exhausted me; I PRed, but doled out splits far beyond what I was ripe and ready for. Hence my advice to CHRC runners who’d join me in the NYC Marathon and Ted Corbitt later that fall: such head games a banana suit plays with us. I’ve not a regret. However, if I could produce one change, I’d ask the ever effervescent announcers on the PA: might you opt for puns of a less slippery sort. I’m sure they could find more tasteful low hanging fruit.